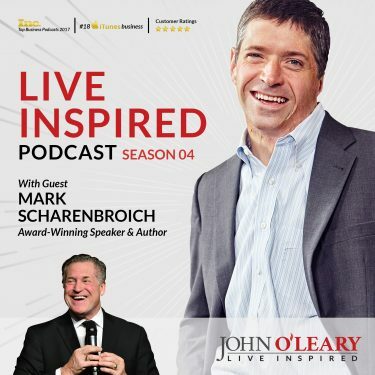 Bestselling author of Nice Bike, phenomenal leadership guru and longtime speaker, Mark Scharenbroich is going to school us on how to connect more effectively with people AND: remind us the importance of doing it. My shop teacher, Leroy, had a big influence on me. One day he asked how I was doing. I said fine. He said, did you think that through? Fine? Is that the kind of life you want to live? He said ask me how I’m doing. I’m GREAT. Great is something to strive for. That’s the direction I’m going. God gave each of us a gift. It’s our job to discover it and use it for good. On not so good days I still say “I’m great” and in my head I add “ful” – grateful. If you see something say something. When people go out of their way to help, say something; thank them. The right moment to tell someone they’ve had an impact on your life is right now. Acknowledge, honor, connect. Acknowledge means be fully present. Honor means create rich experiences for others both large and small. Connect means make it personal. You must be present to win. To win with friends, family or coworkers: The people in front of you have to be more important than someone on a screen far away. Giving just a little more than you take is honoring other people. Treat each night like its your first and each day likes its your last. If you’re waiting for the perfect day or moment, it’s not coming. As long as you are here, be grateful, take time out, embrace those around you, see their value, be interested in whats happening. That’s engagement and having an impact. Order Mark’s book NICE BIKE. 1. What is the best book you’ve ever read? D Day, Steven Ambrose. It has inspired me more than anything else and taught me what true leadership is. 2. Tomorrow you discover your wealthy uncle shockingly dies at the age of 103; leaving you millions. Franciscan Sisters of the Holy Spirit. 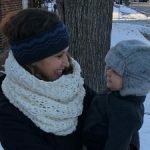 Create a really cool fishing experience for me and my wife. Then impact some lives as a guardian angel / anonymous – stepping in to give money. 3. Your house is on fire, all living things and people are out. You have the opportunity to run in and grab one item. My winning log book – been fishing with the same guys for 40 years. I’ve logged each trip in that book. 4. You are sitting on a bench overlooking a gorgeous beach. You have the opportunity to have a long conversation with anyone living or dead. Who would it be? Abraham Lincoln. I’m interested in hearing about his heart, mind, courage, self doubt, wisdom. 5. What is the best advice you’ve ever received? Never forget a friend and never let a friend forget you. Friends are an investment you have to make. Invest in those around you and don’t take it for granted. 6. Looking back, what advice would you give yourself at age 20? Have more confidence. Believe that your core convictions are true and you can count on them. Take more risks then you think you are capable. To thine own heart be true. 7. It’s been said that all great people can have their lives summed up in one sentence. How do you want yours to read? He taught us how to live the greatest days of our lives so far. Today I got a chance to use the “Inspired 7” plus I added a few more questions, as an icebreaker for a team building session at work. It was very thought provoking and a perfect start to an inspirational meeting of our team. It left a few of my team mates in tears as they pondered their responses. It is always good to let your guard down and allow yourself to become completely vulnerable. 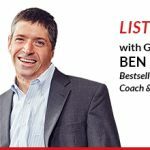 We now have a greater understanding of our teammates, which is a foundation for the development of our deeper and more personal connections. Thanks for the inspiration I receive each and every week!! I’m about to embark on my 43rd year in the classroom. I’ve listened to Mark live over a dozen times and there always seems to be a take-away including your pod cast. I am most impressed with Mark’s ability to stay current with high school students. I teach with a lot of what Mark talks about and I’ve purchased his resource material to augment my leadership lessons. There is a young up and coming teacher in the Sumner School District near Seattle that you may want to meet. He has developed a “Character Strong” curriculum that is taking off in the northwest. The young man’s name is John Norlin and I think you should look in to what he is doing. This is right up your ally.